The print table is twice the size of the current model. 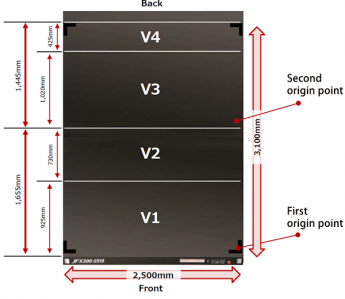 It accommodates panels as large as 2.5 m × 3.1 m. Two 4 ft × 8 ft (1,220 mm × 2,440 mm) panels can be mounted on a single table. Moreover, the printer allows printing material as high as 50 mm and weight up to 50 kg/m2 to be used. 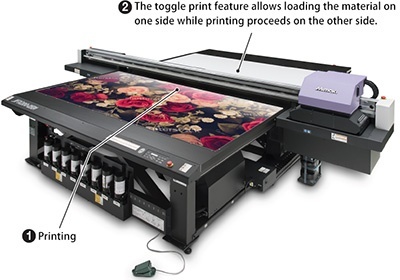 Given its versatility and ability to handle large printing sizes and weights make the JFX200-2531 an evident choice for businesses that aspire to grow. 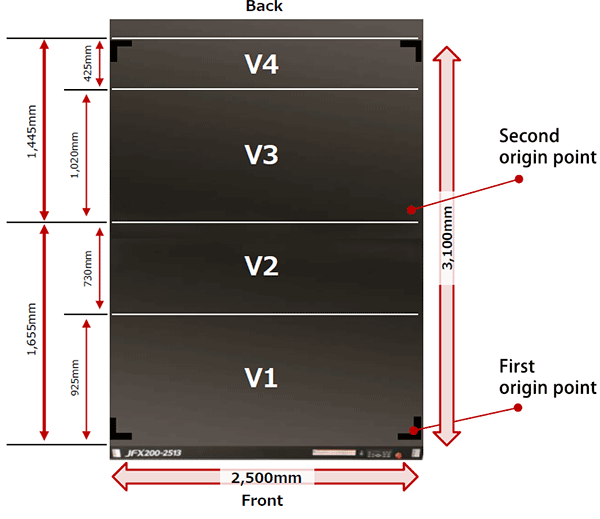 By employing the large printing area of 2.5 m × 3.1 m, two printing origin points can be set. The toggle print feature allows loading/unloading the print material of one side while printing on the other side. This feature improves the printing efficiency. The ionizer is installed at the backside of Y-bar. This minimizes the negative printing effects associated with the electrostatic nature of various media. The printing material can be fixed onto the table using vacuum. Four suction areas are separately controlled by using valve switches. The vacuum power can be adjusted by controlling vacuum at any unused area. The associated printing material stability enhances printing accuracy. The new JFX200-2531 model has four valves to separately control vacuum at each area. This pedal allows operators to switch the vacuum power without the need to access the control panel at the front side. Unwanted visible banding (*) on the swath boundaries is reduced by overprinting between swaths with a reduced number of ink droplets. * Visible lines generated on the swath boundaries. Each ink color has its own specific gravity and viscosity. 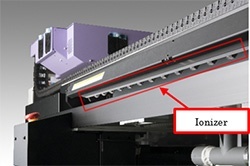 To achieve a precise placement of ink droplets onto the media, Mimaki has designed an optimum waveform control technique that allows the printhead to jet each ink color at an optimum angle, maintaining excellent ink droplet circularity. Thanks to precise ink droplet landing, three different droplet sizes are properly used for providing optimum print results. 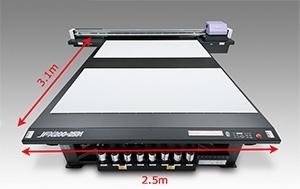 Mimaki clear control (MCC) has been newly added to the JFX200-2531 model. This technique adds a glossy finish on desired areas and a premium appearance to the print. However, clear-ink prints tend to be ruined by dusts adhering to uncured inks. In order to minimize dust adhesion and air bubbles on the print, MCC shortens the ink curing time by processing the clear ink print and UV-light irradiation simultaneously. MCC provides a gorgeous gloss finish and a stylish matte finish. Moreover, an embossed print is available by multiple applications of clear ink on specific areas; it adds a dimensional appearance to the print and enables representing the freshness of food or elaborate designs. Various UV-curable ink types to satisfy a wide range of application needs. A user can choose an optimum ink depending on materials. The LH-100 ink has a high scratch/chemical resistance and an accurate color reproducibility. This ink is suitable for rigid materials. The LUS-120 ink has 170% stretchability after curing. Its ink film is very flexible and will not crack during post print processes. The LUS-150 ink has 150% stretchability after curing and will not crack during post print processes. This ink is compatible with a wide range of materials and has a low degree of tackiness. The LUS-200 ink has 200% stretchability after curing. The ink film retains the print quality, and will not crack even when printed materials are bent or stretched during post-print processes. * Optional kit - OPT-J0393:PR100/200KIT FOR JFX200 - is required for using a primer (PR-100/PR-200). * Stretchability of each stretchable ink may vary depending on materials, please test on actual materials in advance.